Working in the "computer music" field, Carnegie Mellon Professor Roger Dannenberg knows what it means to be interdisciplinary. Along with former student Dominic Mazzoni (CS '03), Dannenberg created Audacity, a free tool that users are finding helpful at the intersection of computing and music. "Audacity can be used any time you're trying to work with audio on a computer, whether turning old LP's into CD's, recording a message for your phone or editing live music you've recorded," said Dannenberg, who works in both the univeristy's School of Computer Science and School of Art. Audacity is wildly popular. The open-source audio editor was chosen as one of PC World's 100 Best Products of 2008. Dannenberg and Mazzoni were inspired to create the product while attempting to analyze wave form data. With no adequate tools available, they created their own audio editor, capable of running on researchers' different operating systems. Coincidentally, Apple had just switched to the OS X operating system, so for awhile, Audacity was the only audio editor running native on OS X. And downloads of Audacity exploded. "It's really taken on a life of its own," Dannenberg said, explaining how the open-source aspect of the tool has helped continue its advancements. "Volunteers have the opportunity to fix bugs and make extensions. It motivates people to donate their time and create things that just wouldn't happen any other way." 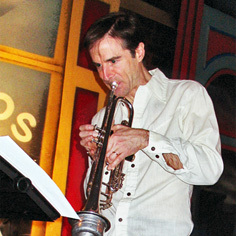 Dannenberg is also an accomplished trumpet player, who honed his musical skills under the instruction of Anthony Pasquarelli at Carnegie Mellon while pursuing his Ph.D. in computer science. He performs regularly and composes pieces for traditional performers interacting with computers in real time. His dual interests harmonize perfectly. "Not only do I get to use computer science to realize these pieces that I'm composing, but a lot of the best computer science research I do is informed and inspired by my musical problems," he said. Dannenberg values his unique Carnegie Mellon experience — as both a graduate student and professor. "I not only had a really great education in computer science, which has been essential to everything, but I also learned a tremendous amount of music. That has really changed my life," he said. "This is also a great place to work, with a lot of open-minded people that accept what I do. It's hard to imagine any other place where I would be able to have this kind of career."